Transtherm Cooling Industries Ltd is a family owned and operated HVAC supplier in Coventry, UK. We create bespoke pieces of equipment that use pioneering technological advancement of heat exchange and water cooling systems for commercial and industrial applications since 1989. 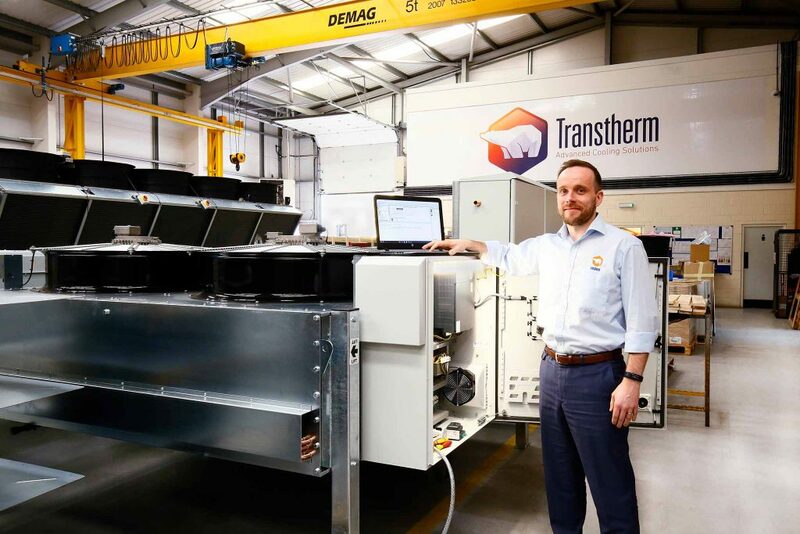 Operating across industries such as; automotive, power generation, HVAC, and data centres, Transtherm provides advanced, cost effective, energy- efficient cooling solutions. The Transtherm brand was originally founded by my father, Ken Bound, in 1981 and was initially a joint venture with two co-directors who had been customers to Ken whilst at a previous employer. The original company was forward thinking but was supplying heat recovery products at a time when lowering carbon footprints was considered a luxury rather than a given. As a result, Transtherm Cooling Industries Ltd was formed in 1989 and began to represent the early designs of the energy efficient cooling products we supply today. We export all of our products such as air blast coolers, adiabatic coolers, Genset cooling solutions, packaged free cooling systems to name a few. To markets such as, Europe, Africa, Middle East, South Africa, Indonesia and just started to export to America and Canada. And how long has the company been exporting? The company has been exporting for 20 years. Initially our motivation was led by our customers, if they wanted our products then we’d made them for them. Through this we saw an opportunity to de-risk our business, the more markets you operate in the better it is for your business and reputation. It took us a couple of years to fine tune orders that were exported as we weren’t used to trade and customs laws in different markets, but once we’d learnt the ropes we were soon on our way. How much of your business now amounts to exports? What is most challenging thing about exporting? I’d say the most challenging aspect about exporting is taking in to consideration the technical regulations of each country. Currency exchange is always a problem for us, but we’ve learnt that you can overcome this with good cash flow as it allows us to buy in bulk which means we get a better rate. In terms of if we’ve ever had difficulties with language barriers or culture, the answer is no. We’re pretty fortunate in the fact that we have such a diverse workforce so in the 29 years that we’ve been operating, we’ve never had any issues with communicating with our clients. Being honest, we found that as an SME we’ve never found support forth-coming. Usually agents or representatives want you to join a trade body or attend a seminar where they say they can help represent you but nothing ever materialises. These days the support comes in the form of our customers or trade partners. Firstly ask yourself if you feel that you have thoroughly exploited the current market that you are in, if not then I urge you to do so. This is because you’ll probably tap in to undiscovered opportunities thus boosting your ROI in that market rather than investing more funds in to a new one. Secondly, consider all aspects, and by this we mean analyse every part of your business plan. I’d even recommend that you give it to someone else to look at, as they might have salient points about your approach or your strategy that you might not have even thought about. Where next? What markets are you looking into and where do you see the company in five years’ time? We’ve recently started exporting to America and Canada, within the next five years we’re looking to expand to South Korea and beyond. As I’ve mentioned before our decision to start exporting abroad was influenced by our customers so whenever they come to us with a HVAC problem, because we specialise in bespoke equipment we’ll endeavour to help them where ever they are based.